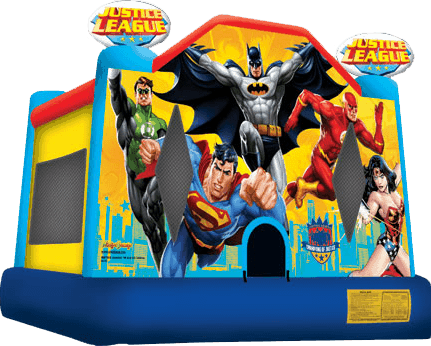 Superheroes in training will get a thrill from the Justice League bounce house from Clowns.com. This fun and exciting bounce house comes with a slide and lots of room for bouncing fun. Kids will get excited when they see Superman, Batman, Wonder Woman, Green Lantern, and Flash on the front. A three-dimensional logo pops out for everyone to see this meeting spot of the Justice League. 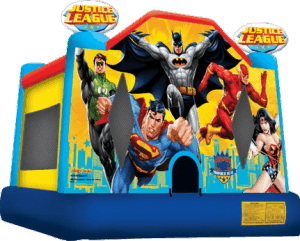 For Justice League bounce house rentals in New York, trust Clowns.com to deliver the best rates and availability of this fun party add-on. Clowns.com provides bounce houses throughout the greater New York City area including Westchester, Staten Island, Long Island, Manhattan, Brooklyn, Bronx, and Queens. Whether you are throwing a child’s birthday party in a backyard or a community event in a neighborhood park, an inflatable bouncer will add tons of fun and excitement that will keep kids entertained for hours. This deluxe bounce house is perfect for any little adventurer. Watch through the 360-degree mesh windows as little superheroes pretend to be Batman or Superman. 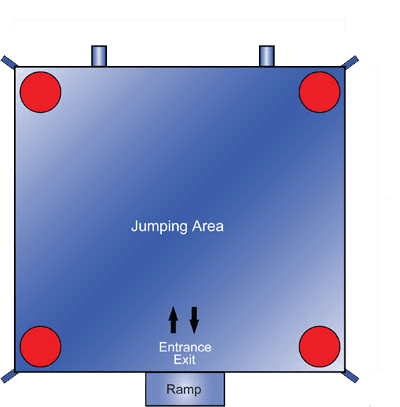 The Justice League slide bounce provides space for plenty of adventures. Let Clowns.com plan an entire day of Superhero-themed fun in addition to your Justice League bounce house rental.